Both teams play a pretty boring style of collapsing and blocking shots whenever possible. Each club has a defensive style that chokes out their opponents. They rely on their goaltenders to do the heavy lifting when necessary but typically limit as many shots and chances as possible. The Coyotes will live and die with Mike Smith. Many, including myself, wondered if he was an appropriate solution for the Desert Dogs. Turns out that he has been beyond adequate this season and will be a shoo-in for the Conn Smythe, should the Coyotes win the Cup. If, for some unseen reason, Smith falters, the Coyotes will make a quick exit. Phoenix squeaked by Chicago on the coattails of Corey Crawford’s gaping five-hole. But the Yotes were sound in their five-game dispatching of Nashville. However, one thing that caught my eye in both series was the fact that Phoenix wasn’t necessarily the best team on the ice. The Coyotes have employed a terrific system that keeps them in a lot of games by stifling just about any scoring attempt against. What concerns me about the Coyotes is their ability to perpetuate this system in which they are clearly the second best team on the ice. The Predators had less success than the Blackhawks did, but carried the play in their series for long stretches. The Kings were successful in both of their series by stifling offense and creating counter-attack opportunities. I question the lack of lethal scorers on the Coyotes roster and their ability to keep up the pace they have against another opponent. Like the Coyotes, the Kings have received super-stellar goaltending on their way to the WCF. Jonathon Quick should win the Vezina running away and is due a spot in the Hart Trophy running, despite being snubbed. What I like about the Kings is that they have scoring depth and have shown their ability to flex that muscle. While their defense has been what got them to this point, I feel their offense is what could carry them to the Cup Final. They have two solid scoring lines that have been playing good hockey and their defensive system stifled the President’s Trophy winner before sweeping away the West’s second best team. The Kings could fall victim to the Coyotes skill at keeping the puck to the perimeter. If LA is unable to get to the dirty areas and create chances, they will not succeed. Another thing that will hinder the Kings is the counter-attack. They made a living countering their first two opponents, but the Coyotes are such a conservative bunch that I don’t see the odd-man rush game favoring the Kings. Scoring early will be important if LA hopes to shake the Coyotes from their usual strategy. The Rangers have been a very peculiar team to follow through the first two rounds of the playoffs. They haven’t scored many goals, looked over their heads at times but have gotten the job done twice. They have shown some flaws that stand out as major red flags, but they have come through in big moments time after time. New Jersey could potentially be the biggest surprise in the playoffs if they are to advance to the Finals. Sure, the Kings are an eight seed, but they have established talent. The Devils, while quite talented, are an unheralded bunch. Marty Brodeur is managing to play sound hockey and his team has been scoring plenty of goals in support. The Rangers are overdue to prove their dominance to someone. They didn’t go through the season steamrolling opponents and that is shining through here in the playoffs. New York plays such a safe, guarded style that any team can hang with them. However, the Rangers big players – namely Lundqvist and Richards – have been driving the bus. If these two can continue to carry the load, there is no reason why New York shouldn’t advance. The only thing that the Rangers may struggle with is the New Jersey forecheck. The aggressive system gave the Flyers fits and has been key for the Devils through two rounds. 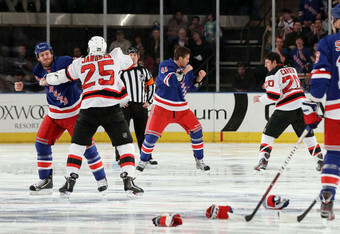 The high-paced attack the Devils like to use is a polar opposite to the balanced, methodical system run by the Rangers. They will need to neutralize the Devils offensively to be successful. The Devils have been a well oiled machine through two rounds. Their stars are scoring, their system is running well and their goaltending has been adequate. New Jersey squeaked past Florida before rolling the Flyers. They will need to impose their will on the Rangers in order to pull another upset. The key for New Jersey will be to break the Rangers of their ways. If the Devils are able to open up the Rangers, they will be able to counter-attack and force the play with their forecheck. If the Rangers are able to play their game, the Devils will have a much harder time creating and winning games. Ultimately, this series will come down to goaltending. King Hank has been nearly flawless and has carried his team throughout. If this stays as a tight series, I’m taking the Rangers because of who is between the pipes. Previous Article Bikini Hockey League: Good for the sport?